Okay guys, let’s talk about what’s going on in your bedroom. Wait, that sounds sexual. Specifically, what’s happening on your bed. Nope, just made it worse. What I mean to say is, today we’re talking about bedding for men. Because the way you dress your bed says as much about your style as the clothes you put on your back. Assuming you’ve upgraded from your childhood twin racecar bed, there’s a full, queen or even king-size bed making a style statement about you—good or bad—in your bedroom right now. If there’s not already a woman in your life…collaborating…on your bedding, you’re probably hoping there will be at some point. You want you and your bed looking good when that day comes. When it comes to bedding for men, this is not the time to go crazy with prints and patterns. You want a set of sheets—or two, or three—that will see you through any redecorating or move. Think: a new color on the walls, or a new bed frame. Meaning? It’s smart to go for neutral colors. I’m talking grey, khaki, or, yes, even white. It’s not boring, it’s practical – and classic. Oh, and please…no black sheets. Using black sheets on your bed is like installing those ultraviolet lights the contestants used on Room Raiders, as light bulbs. Everything shows. All the time. Nobody wants that. Let’s get one thing out of the way—satin and silk sheets are never an option. Sure, yes, they’re soft. They’re also ridiculously tacky. Any self-respecting woman who sees a bed outfitted in the faux-romantic fabric will look at you like you’re Deuce Bigelow, then leave. Since we already agreed on neutral colors (right? right), you can plan on having these sheets a long time. So go ahead and spring for the good stuff—100% cotton. 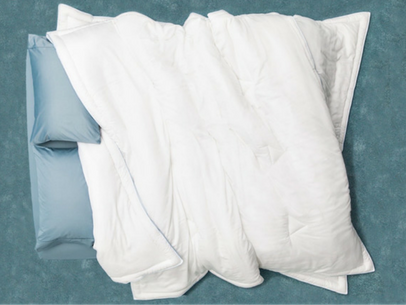 Yes, poly blends are cheaper, but nothing beats cotton for a good night’s sleep. It’s super soft and “breathes” better than a blend – like the UnderArmour of bedding. When it comes to sheets, we’ve all been conditioned to think, It’s all about the thread count! The higher the better! But what does that actually mean? Well, thread count is the number of threads running horizontally and vertically in one square inch of fabric. Think of thread count sort of like a sunscreen’s SPF. Above a certain number, it’s really not worth the extra cost. Bottom line? Aim for 250-300 thread count, and you should be set. More important than thread count is the weave of the fabric. Look for a long weave, which feels softer and will wear better than a basic plain weave (which just means it’s made from an equal number of vertical and horizontal yarns). Sound complicated? Just search out words like “pima,” “supima” or “Egyptian long-staple” on the label, and you won’t go wrong. Now for the master class in bedding for men: a comforter versus a duvet. Much like the defining features of a skirt versus a dress, it’s come to my attention that many guys don’t know the difference between these two sheet toppers. So here goes. A comforter is the big fluffy bedspread you put on top of the bed. A duvet covers a down comforter, almost like a pillowcase. You can, of course, get a comforter that doesn’t need a duvet (think those “bed in a bag” combos sold at Linens ‘n Things), but then you’ll have to wash the whole comforter when it’s dirty, as opposed to slipping off just the duvet. To me, that seems like an unnecessary hassle. Plus, a duvet is easier to replace when you get sick of it than a patterned comforter. For the design, it’s up to you what strikes your fancy. You don’t need to play to the female audience with pastels or florals, but also know that if you go super masculine (pinstripes, paisley, naked ladies), it may feel a little like you’re performing your manliness. And trust me, that’s not where the performance counts in the bedroom. Sheets should be washed every week to two weeks (and that’s pushing it). A comforter or duvet cover should get laundered every month to two months. Seem like a lot? Ready to upgrade more than your sheets? Style Girlfriend can help you as you level up your wardrobe. If you’re ready to invest in some new clothes but dread the thought of shopping for them…consider having Team SG shop for you! We can curate an online shopping list just for you that fits your budget, your body type, and your lifestyle.